^ Termin održavanja (7 November 2016). "Destinacije – Zadar – 3000 godina povijesti - Kongresni turizam". Poslovni turizam. Retrieved 9 March 2017. ^ "Best places to travel in 2016 - Europe's Best Destinations". 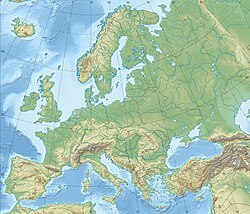 Europeanbestdestinations.com. Retrieved 9 March 2017. Jayne, Kingsley (1911). "Dalmatia" . In Chisholm, Hugh (ed.). Encyclopædia Britannica. 7 (11th ed.). Cambridge University Press. pp. 772–776. Chisholm, Hugh, ed. (1911). "Zara" . Encyclopædia Britannica. 28 (11th ed.). Cambridge University Press. p. 959. Chisholm, Hugh, ed. (1911). "Illyria" . Encyclopædia Britannica. 14 (11th ed.). Cambridge University Press. pp. 325–327. ^ "Zadar (Croatia) - Sea Organ". YouTube. 18 September 2006. Retrieved 16 September 2011. ^ "Museum of Ancient Glass – Zadar Sightseeing in Zadar". Inyourpocket.com. Retrieved 12 March 2013. ^ "56. Glazbene večeri u sv. 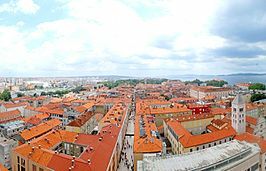 Donatu - Zadar Hrvatska". www.donat-festival.com. Retrieved 12 December 2016. ^ "SAS Output". Dzs.hr. Retrieved 2 July 2011. ^ "SAS Output". Dzs.hr. Retrieved 6 May 2009. ^ "Zadar i Milwaukee dva su grada bratska!". Zadarski list. 28 February 2015. Retrieved 12 December 2016. Begonja, Zlatko (July 2005). "Iza obzorja pobjede: sudski procesi "narodnim neprijateljima" u Zadru 1944.-1946". Journal of Contemporary History (in Croatian). Zagreb: Croatian Institute of History. 37 (1). ISSN 0590-9597. Retrieved 6 February 2013. Graovac Matassi, Vera (2014). "Contemporary Urban Changes in Croatia - The Case Study of Zadar". In Calcatinge, Alexandru (ed.). Critical Spaces: Contemporary Perspectives in Urban, Spatial and Landscape Studies. LIT Verlag Münster. ISBN 9783643904959.